Stuart Semple b.1980 lives and works in Dorset, England. He studied fine art at the Yorkshire Sculpture Park. Stuart has enjoyed over 15 solo exhibitions dedicated to his work in New York, Los Angeles, London, Milan and Hong Kong. Semple’s works have featured in numerous group shows, fairs and biennials and at institutions including, The Barbican, ICA London, Metropolitan Museum NY, Goss Michael Foundation, Coventry Center for Contemporary Art, Sao Paulo Biennale, Frieze, Art Basel Miami and the Hong Kong Art Fair. His pieces can be found in notable public and private collections including, The Getty, Langen and David Roberts foundation collections. Harvard Museum, Metropolitan Museum & Seoul Museum of art. Semple has written for The Guardian, Huffington Post and held a weekly column for Art of England Magazine. He has presented an art and design show for the BBC and been featured in publications including Wired, Financial Times, GQ, Flash Art, ArtForum, Modern Painters, The Art Newspaper, New York Times and Architectural Digest. Semple has collaborated with cities including Melbourne, Dublin, London, Moscow and Manchester on major public art projects around happiness and inclusion. His most ambitious was Happy City (2018) In which he created several large scale public interventions throughout Denver. He regularly speaks on art and mental health and has appeared at Denver Art Museum, Oxford University, Royal College of Art, The Southbank Center, The Whitworth, Frieze London and others. On the first International Day of Happiness Stuart Semple was honoured by the UN with a Happiness Hero medal in recognition for his “HappyCloud” performance from Tate Modern in London. Semple is an ambassador mental health charity Mind, with whom he initiated the creative therapies fund throughout England and Wales. Born in Dorset in 1980, Stuart Semple became an artist after a traumatic near death experience at the age of 19 whilst studying Fine Art at Breton Hall in the Yorkshire Sculpture Park. Since 2000 Semple has enjoyed a successful artistic career in which he been the subject of 15 international solo exhibitions. He has featured in over 40 group shows and major public art projects. In Stuart Semple’s works, the emotional and spiritual impact of mass culture on the individual are re-imagined with a playful, exuberant and sociological language. Semple’s hybrid compositions often comprise of disparate appropriated and found elements which he weaves into alluring surfaces that encapsulate a deep critical analysis of contemporary culture. His world is one of low-culture internet trash, 90s nickelodeon colour palettes. indie music, obscure music videos and cultural theory straight out of the 60s Frankfurt school. Stuart Semple is a keen innovator, who’s creativity often expands beyond the canvas in the form of the creation of his own art materials, internet art and public works. Semple came to initial public attention in 2009 through his public art project ‘HappyCloud’ in which he released thousands of smiley faced clouds made from soap and helium from Tate Modern towards the city of London. A public art project that has since been repeated in Milan during Salone De Mobile, Moscow & Dublin. Other public artworks have included ‘Jump’ for the City of Melbourne in which he installed a giant inflatable bouncy sculpture in Federation Square and ‘My Happy Place’ for Coventry Center for Contemporary Art. In 2018 he colaborated with various institutions in the city of Denver to create ‘Happy City’ a 6 week interdiciplinary public art intervention of large scale sculptures, happenings, exhibitions and interactive works. In 2016 Semple achieved worldwide noteriaty after his release of the world’s pinkest pink pigment online and the subsequent exclusion of artist Anish Kapoor from using it. The ensuing ‘Art War’ between the two artists over colour became a conceptual performance piece about acceibility, eletism and community. His colour creations can now be found in the permenent collection of the Harvard Art Museum pigment library. Semple regularly participates in curated group shows, fairs, biennials and charity projects, through which his works have been exhibited at ICA, The Goss-Michael Foundation, Sotheby’s, Sammlung Fide, The Fine Art Society, Torrance Art Museum, Pallant House, and the Museum of Art and Design, NYC. As a keen collaborator he has worked on several artistic projects outside his usual practice with partners including Moncler, Bulgari, Selfridges, Placebo, The Prodigy and Umbro. 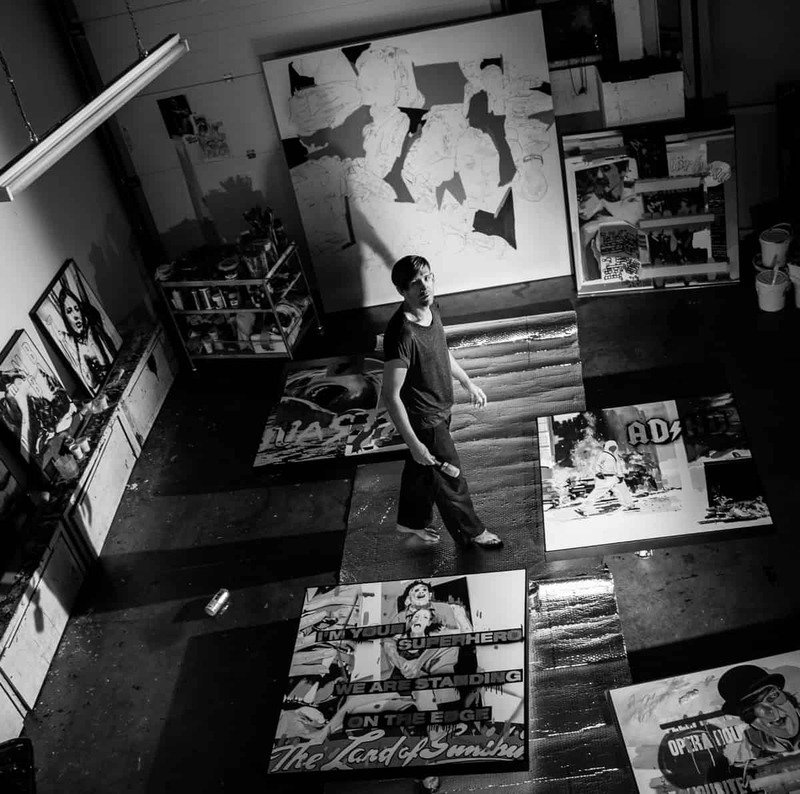 His works have been featured across the media in Modern painters, The Guardian, Time Out, Independent, Observer, Vanity Fair, BBC news, i-D, Blue Peter, Vice, Esquire, Italian Vogue, Elle, Dazed & Confused, Evening Standard, GQ, Wired, The Sunday Times, new Scientist, The Week and several other publications. Semple regularly speaks on his art, mental health and artists’ rights and has appeared at the ICA, Frieze London, The Royal Drawing School, Jerwood Space, Oxford University, Royal College of Art, Central St. Martins, Denver Art Museum and Museum of Modern Art, Dublin. Stuart has also written for The Guardian, Spanish Vogue, Huffington Post, Phoenix Magazine, Who’s Jack and held a regular column in Art of England for several years. He has also presented the BBC’s Art & Design learning series ‘Bitesize’. In 2011 Stuart Semple became an ambassador for Mind, the mental health charity where he initiated a creative therapies fund. He curated a fundraising exhibition at the Old Vic Tunnels featuring works by Tracey Emin, Matt Collishaw, Sarah Lucas and the Chapman Brothers amongst others, the exhibition launch was co-hosted by Stephen Fry and Lord Melvyn Bragg. The fund now supports creative therapies thought England and Wales. In 2015 he went on to to produce the Amazon bestselling book ‘My Happy Colouring Flip Book’ to further support the fund. Stuart Semple now lives and works in Dorset, England.